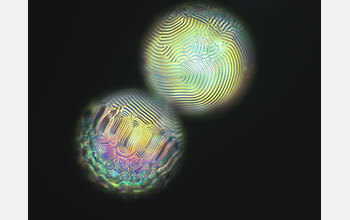 While investigating patterns in liquid crystals, Lisa Tran, a graduate student in the Department of Physics and Astronomy at the University of Pennsylvania�s School of Arts and Sciences, discovered dancing iridescent spheres with fingerprint-like patterns etched into them that spiraled and flattened as the solution they were floated in changed. Liquid crystals -- fluids with aligned phases of constituent molecules -- are used in everything from computer and television displays to mood rings. Since liquid crystals are made of rod-like molecules, they have special optical properties, such as changing color as they interact with electrical signals or light. 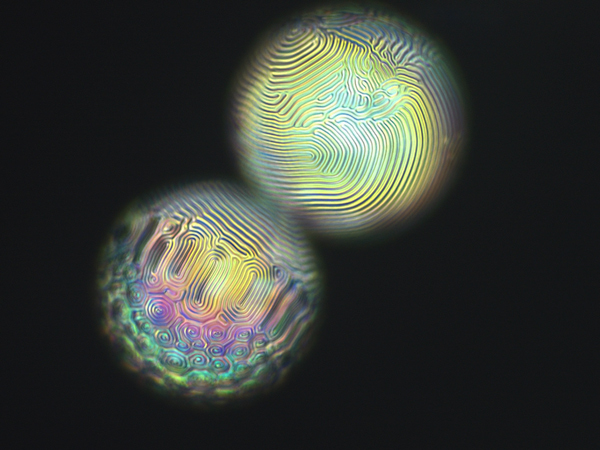 For her research, Tran confined the liquid crystals within droplets, creating shells floating in water. To create patterns, she then added surfactants, or soapy molecules, to the water. "The way that soap usually works," says Tran, "is that you mix it with water and it forms small droplets with the oil to remove it from your hands or your plate." Because liquid crystals are similar to oil, the surfactants were attracted to the liquid crystal shells, causing the molecules to order in different ways and create striking patterns. The more soap she added to the solution, the more the patterns changed. Adding water caused the patterns to reverse. Being able to control the patterns that form on the liquid crystals could be useful in creating patchy colloids, microscopic particles suspended in water that are functionalized, meaning one can attach molecules to specific spots on the particle. The research, supported in part by a grant from the National Science Foundation (NSF), is a key component in one of the interdisciplinary research groups of Penn�s recent NSF Materials Research Science and Engineering Center grant (grant DMR 11-20901). The group is working to make assemblies of nanocrystals on hard templates and within soft materials that hold promise for applications in sensing, energy conversion and optical-signal processing.